Think their new deal includes dental? Just because you've hit retirement age doesn't mean you can't sign a new record contract. And that's just what The Rolling Stones have done, inking a deal with the Universal Music Group and leaving EMI after a 17-year association. Financial details were not disclosed but the move is a major blow to EMI as the rockers still sell about three million units a year from their extensive catalog, which will now be handled by Polydor and its sister Universal companies around the world, along with any new material. The pact with Universal covers such landmark albums as Sticky Fingers,Exile On Main St. and Black and Blue, and such global anthems as Brown Sugar, Angie, It's Only Rock 'N Roll and Start Me Up. "Universal are forward thinking, creative and hands-on music people," The Stones said in a statement. "We really look forward to working with them." Full digital and physical rights are part of the agreement and Universal is planning a long-term campaign to reposition the band's entire catalog for the digital age. 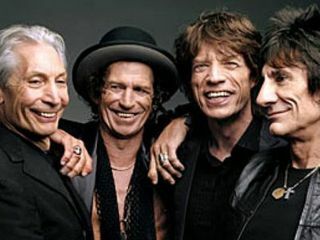 "There is no question that The Rolling Stones are one of the most important bands in music history," stated Doug Morris, chairman and CEO of Universal Music Group. "Their musical style and off-stage swagger have been emulated by countless others. Having worked closely with them during my days at Atlantic Records, I am thrilled to be reunited with these seminal musicians who have set the bar for all rock bands." And no doubt Keith Richards is at a bar right now, celebrating.